FILE - A Brazilian Indian of the Guarani-Kaiowa tribe patrols after invading a private ranch that they consider part of their "tekoha," or sacred land, in Paranhos, Mato Grosso do Sul state, Sept. 4, 2012. A year after witnessing the murder of his friend by a gang of farmers in Brazil's agricultural heartland, indigenous activist Elson Gomes still fears for his life. Plus he misses his friend. "He was a strong guy," said Gomes, 30. "I miss him, and his commitment to our cause, every day." The flat, dry, expanse of savannah - ideal for growing soy or grazing cattle - sits near Brazil's border with Paraguay. Historically, the indigenous activists say it belongs to them. Gomes said Brazil's National Indian Foundation (FUNAI), the government agency responsible for protecting the land rights of indigenous people, had missed its own deadline to demarcate the land, or in essence to ring fence it for indigenous people. "We had gathered to protest our treatment, the human rights violations we suffer," he told the Thomson Reuters Foundation. "That's when the farmers arrived in many cars. They opened fire," the activist said. Gomes' friend, community leader and healthcare worker Clodiode Aquileu Rodrigues, 26, died in a hail of bullets at the rally, which was held in Caarapó municipality, 273 km (170 miles) from the state capital Campo Grande. "The government only thinks about agribusiness, not us Guarani-Kaiowa," Gomes said. "We don't have enough land or a place of our own to survive." However, the scale of recent violence, along with the key role played by farming in Brazil's economy, the often hazy nature of property ownership and what activists consider high levels of impunity make the situation particularly dangerous in South America's largest country. "Land conflicts in Mato Grosso do Sul and the murder of indigenous leaders are realities that go hand in hand," Dourados Marco Antonio Delfino de Almeida, a federal prosecutor in the state, told the Thomson Reuters Foundation. "Since mid-2015, organized groups have been perpetrating violent evictions of indigenous communities," said Almeida, whose office is responsible for investigating the killings. Farmers groups have formed "private militias" in the state, the prosecutor said. And the tight-knit nature of farming communities makes it particularly difficult to find witnesses. The rise in deadly conflicts pitting indigenous people against large farming interests in Mato Grosso do Sul coincides with Brazil's worst recession on record, though agriculture has been one of the few bright spots. In the world's top exporter of beef, soy, chicken and orange juice, agriculture accounts for about 23 percent of Brazil's GDP, more than seven times the global average of 3 percent, according to the U.N.'s Food and Agriculture Organization (FAO). FILE - Indigenous people of the Guarani-Kaiowa tribe take part in a protest asking for the demarcation of their lands in Mato Grosso do Sul state, in front of Planalto Palace in Brasilia, Brazil, May 17, 2016. The country's 900,000 indigenous people - who are disproportionately impacted by poverty and other social problems - control about 13 percent of Brazil's territory. And that's more than enough, according to some critics. "Land doesn't fill anyone's belly," Brazil's justice minister Osmar Serraglio said in March, urging indigenous people to "stop this discussion about lands" and focus on economic opportunities. 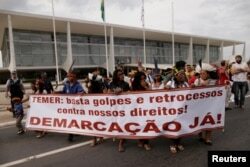 "In Brazil, there is sufficient land and food for everyone," Wolford told the Thomson Reuters Foundation. "A political system that keeps some from accessing those resources is institutionalized discrimination with deadly consequences - necropolitics," she said, referring to the use of power to dictate who lives and who dies. Part of the problem in securing convictions is that police officials and land owners in rural areas often move in the same social circles and are hesitant to target each other, said Jeane Bellini, the CPT's national coordinator, who has tracked land violence in Brazil for more than 20 years. In the past decade, the most common victims of rural violence were activists who occupied farmland near big ranches, particularly the well-organized Landless Workers Movement (MST), she said. "Since the government has slowed down the recognition of indigenous lands, communities have found themselves in direct conflict... with modernized agribusiness who are intent on using the land for soy or other monocultures," she told the Thomson Reuters Foundation. "Now they are all free," Gomes said. "It's an ongoing threat to our community."